We have lived in our house for 2.5 years now. I'm finally getting around to really decorating the kitchen and updating it a bit. I love the layout and roomy size of our house, but it's a bit old fashioned. You know the brass fixtures and hardware everywhere. Not to mention it's a bit bigger than our old, so still lots of filling in furniture. I've gone back and forth with the big stuff and the details (managing what I can in my 'house allowance'). So I finally made some curtains for the big windows by our kitchen table. They compliment my new art perfectly. Anyhow I thought I'd walk through the process of making these particular type curtains if anyone was interested in making some. 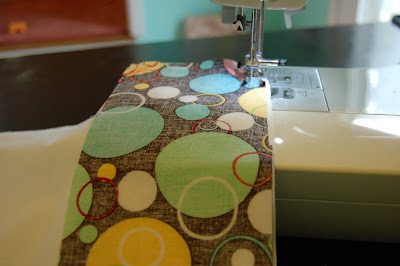 :) First off, the fabrics were from Hobby Lobby and I pretty much used the same technique as in this tutorial. First off, I used white kona fabric as the main piece. It has a nice weight, but I wanted it a bit heavier, so I sewed 2 pieces together. 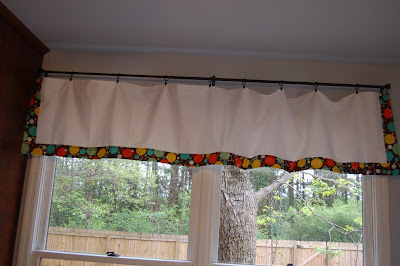 This particular curtain is 18" long and hung 7" above my windows (to give illusion that windows are even bigger than they are) on cafe clips (if you aren't using clips and need a pocket, you will need to add significant more fabric to include that). I sewed the 2 pieces of white fabric together along the top. 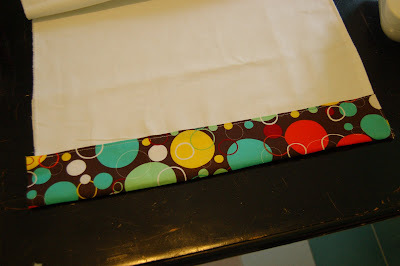 I then flipped them over at the hem and ironed and topstitched, so you have a nice hem at the top. Leaving all 3 other edges raw. The contrasting fabric pieces are 4.5" wide and I cut one for each short side, adding an inch or 2 to turn under at the top, and then I cut several strips and sewed together til I had a strip a few inches longer than the bottom long edge. Now I sewed the side trims on first. 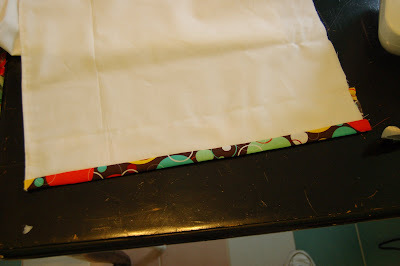 Doing so, you fold down an inch and pin along edge as seen in above photo and you can leave the bottom edge raw. Now sew along the edge. 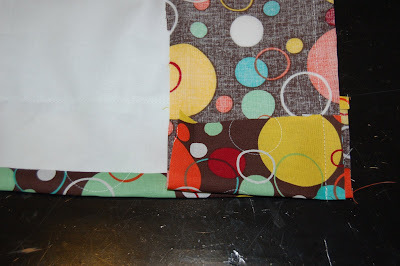 Now turn the fabric over to the other side and turn under hem and sew along the edge of contrasting fabric. This is what it should look like when done on the front. Here's what it looks like on the back side. Repeat this step for other short edge. 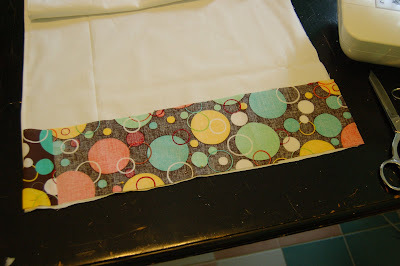 Now take your long strip and use the same process, except you will need to fold under both edges. 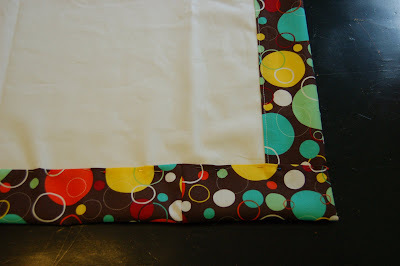 This is what the bottom corners should look like when pinned, then sew down. Now you are ready to hang it! 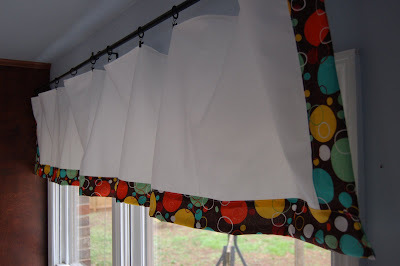 I just need to make one more for the windows down the little hallway across the pantry and laundry. love the curtains! great job and great idea! So cute! I love the retro feel. I love the dresses on the girls, too. Love the bright, fun, fresh retro feel. That fabric is great! Good job. Really cute! Looks like I might even be able to handle these. Thanks.